I discovered Julie Chase through my own publisher, Crooked Lane, when I was asked to read and provide a blurb for her first Tonivel with them! 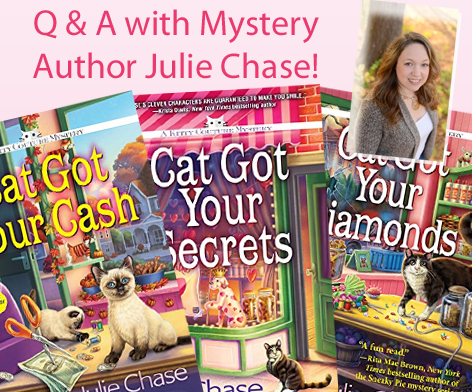 Julie is a mystery-loving pet enthusiast who lives in rural Ohio with her husband and three small children. Julie is a member of the International Thriller Writers and Sisters in Crime. As Jacqueline Frost, Julie also writes the Christmas Tree Farm mystery series for Crooked Lane as well. Toni: Welcome Julie! Tell us a little about your background! JC: Hello! I’m Julie Chase. I’m a Midwestern mother of three. I started writing about seven years ago when I read a book that gave me a much needed escape. When I put that book down, I opened a search engine and typed “How to write a book” because I wanted to give someone else the kind of gift my book had just given me. Toni: Tell us a bit about your Kitty Couture mysteries for Crooked Lane. How did that idea come about? JC: The idea emerged just over a year ago while I was in New Orleans researching for aTonither project. I rode a streetcar to the Garden District and immediately fell in love with the neighborhood. The shops along Magazine Street were so eclectic and inviting. The homes were breathtaking. I had to write about them, and my heroine had to make pet clothing because there’s Tonithing cuter on this planet than a cat in a hat. Toni: How do you “get to kToniw” your characters before and while you’re writing the books? JC: I spend several weeks pondering new concepts and playing with possibilities before I begin writing my stories. It gives me time to understand the personalities I’m dealing with and what to expect from them when I put them in various situations. Toni: How do you construct your plots? Do you outline or do you write “by the seat of your pants”? JC: I’m a dedicated outliner. I always leave room for flexibility, but I have three kids and Toni time, so outlining keeps me on track and more importantly on deadline. Toni: Which do you consider more important, plot or character? JC: I think both are important, of course, but I must admit that I’m a plot girl! I come up with my twisted and mischievous schemes first, then build characters into them and Tonit the other way around. Toni: What is the biggest challenge you’ve faced as a writer and what inspires you and keeps you motivated? JC: The biggest challenge I face as a writer is dealing with self-doubt. I spend far more time questioning myself, my lack of talent and whether or Tonit I’m wasting everyone’s time than I care to admit. Toni: If you could take only three books with you for a year-long writing retreat in a gorgeous setting with Toni library, which three would you take? JC: I’d love to be stuck on an island for a year. I guess I’d take my Bible, and two giant Tonitebooks. I could probably write a hundred stories with that kind of time and solitude! Toni: What advice do you have to offer to an aspiring author? JC: Don’t give up. This industry can be tough, and the rejections can wear you down, but you can make it through. Don’t let anyone tell you that you can’t. You can do this. You will do this. And you’re probably already much closer than you realize.